Thanks to DMI, it is moderately easy to make these, or at least harvest a time series of imagery from the same satellite. Then the issue becomes clouds, tiling coverage and geometric registration. 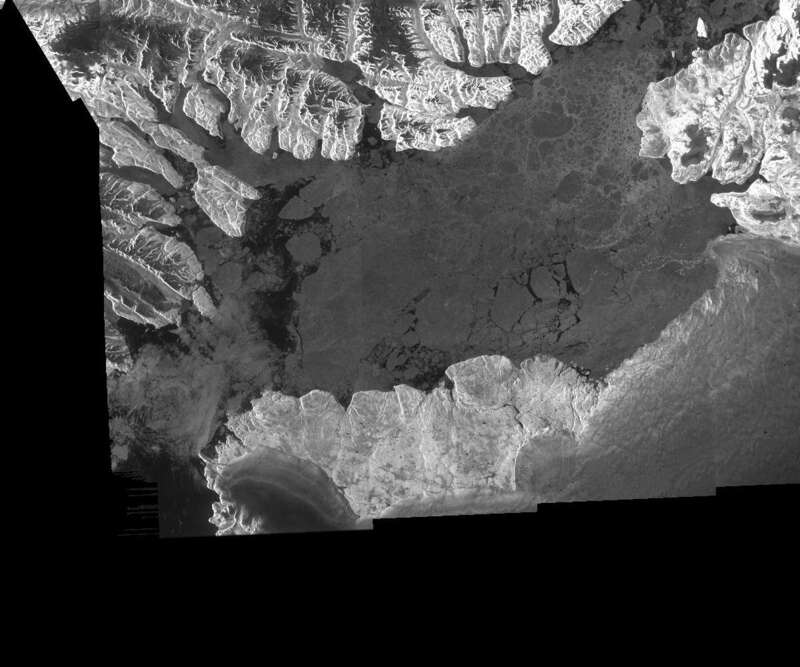 Below I took the last 16 Sentinel images for Kennedy view and aligned on Hans Island. This resulted in so-so global consistency in alignment, beyond what image-specific rotations could fix. To keep file size down, the images are rotated CW by 36º so that a crop box can cut out extraneous land. The arch is not included; that would be a separate exercise using Kane view. Tiling two frames for each day is problematic, though a great project for a hypothetical unpaid summer intern. Sentinel sees through clouds but the downside is different geometry for each orbit. Click to view animation ... it did not work out reducing width to 700 pixels. The pause is on July 10th. I'll post a Petermann Glacier cut-out over at that forum. Looks like the base of the "flying buttress" blew out today (July 12). 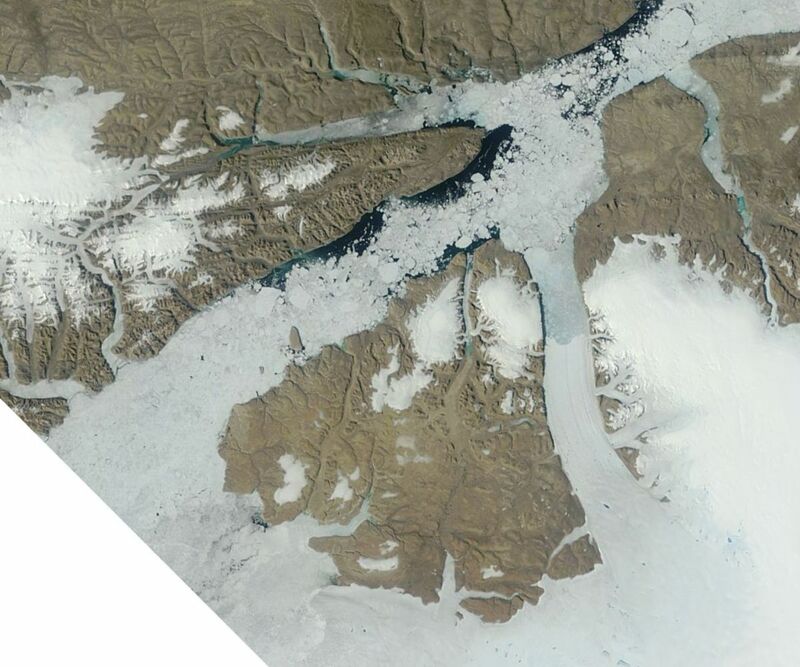 Looks like we'll soon be trying to track chunks of ice flowing out the Nares. I put together a crude animation of Kane basin, using daily AQUA images from DMI. It starts from June 20th and goes on until July 12th, with many gaps in between where images had too many clouds. I think it shows nicely the crumbling of the arch, which was visibly cracked away and started moving on July 9th (the frame with the little extra pause). To my layman's eye it seems the crumbling happened under pressure from the crushed ice coming from the northeast, and after losing some of the buttressing of the fast ice to the west. Edit: managed to make it animate at last, see new post below. This is not a GIF ? but an image "png". Yup, there she blows. Thanks, Tor. It got caught by the Kane Basin ice bridge. Can we find it? Thanks for the animation, Oren, it shows nicely how the ice north of the arch is broken up before the arch starts to give way. It is moving back and forth, but what is driving that movement? I seem to remember Andreas Muenchow writing that tides are quite weak there. Yeah, thanks a lot for the animation, oren. I've adjusted it a bit and used it for a blog post on the ASIB. The tidal range is limited but the tidal race through the narrows is quite fast and the southern flow holds fast to the western/north shore, and is as turbulent as the flow down the east coast of Greenland. Where is Sonia's ice floe hiding? I wonder how big a floe will get through Smith Sound. The largest piece of the old ice bridge could thread its way through or it could get broken into pieces. Clicking between the two images gives a little insight into tide/wind interplay 13th. 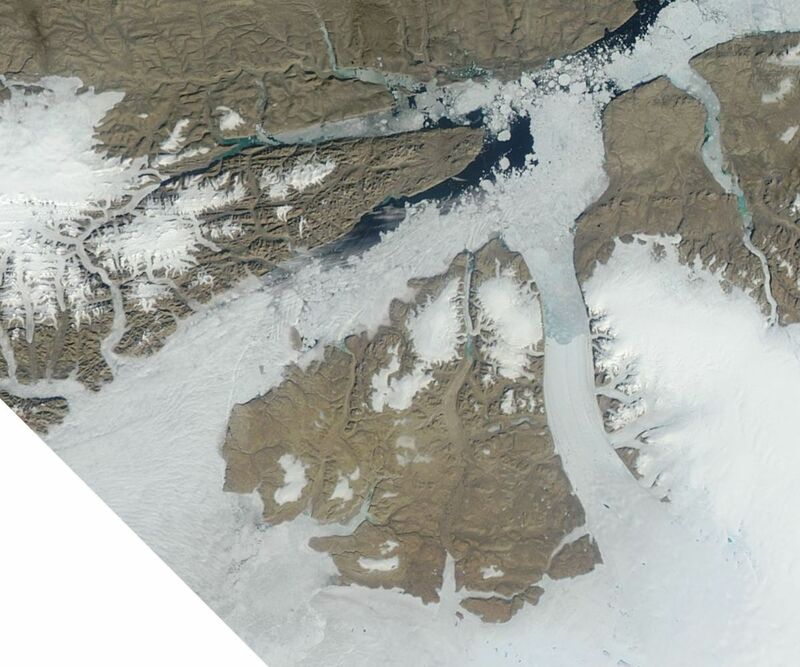 With persistent winds from the south there's been little export, this image sequence ends with the ice breaking up in the fjord opposite Peterman. The winds have shifted, they're now blowing south at about 20kph, the southern end is clouded but this image shows clear signs of the ice moving south again compared to the last of the previous list. Nothing wrong with that location; I would have picked it as the most relevant for the flushing of ice out of Nares Strait, too, but how far off the ground are those model winds? Furthermore, how well does the model agree with direct wind observations such as those on Hans Island? This is yesterday at 15:00 close to Hans Island, the wind speed is about double down at southern Kane, same pattern today just slower, so good for flushing. Awesome what a difference a day can make ... look how much Petermann opened up in 24 hrs. Let's keep an eye out for calving too, what with buttressing back pressure being so rapidly reduced. I looked with a high resolution Sentinel pair for where the next break might be ... some possibilities, nothing definitie. Not change yet in the ice sheet's calving front. 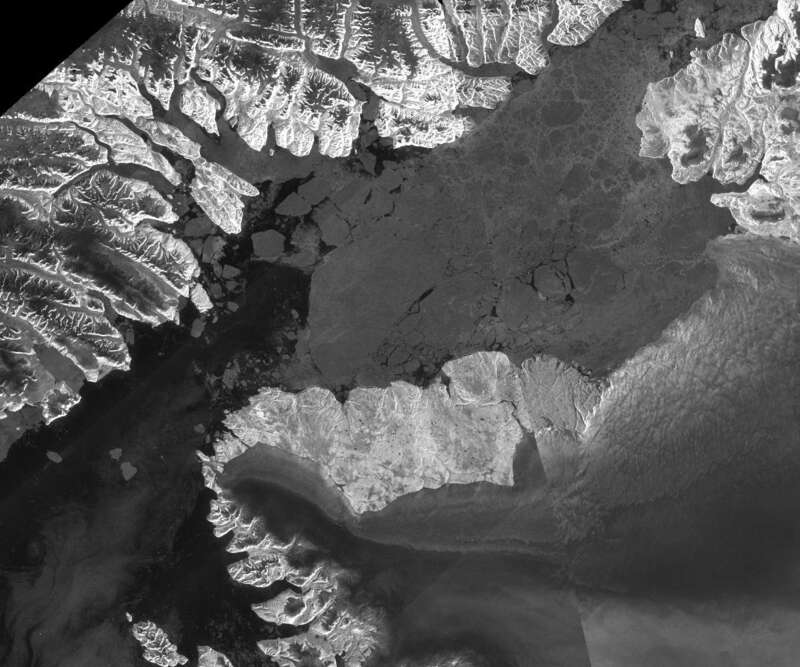 I am looking forward to images from Oden as it goes up Nares strait. The ice north of it looks like it is ready to be flushed towards it. No large floes which might get stuck. Beneath the clouds the southern end is breaking out, if the winds persist for a few days, and at present they're still blowing to the south [6kph] at the exit to Kane basin, we could see the whole strait flowing. More than one by now. Also check out the massive upwelling along the Arctic coast of the Canadian Archipelago indicative of strong winds from east to west that move the apparently very loose Arctic sea ice offshore or to the north. Hans Island winds have been 15 knots (7-8 m/s) for the last 48 hours. There is also a massive sediment plume coming from a river that traces back to the land-termianting Hidatha (spelling?) Glacier. The river discharges into southern Kane Basin. Hope to write this all up more tidily in my next blog post. 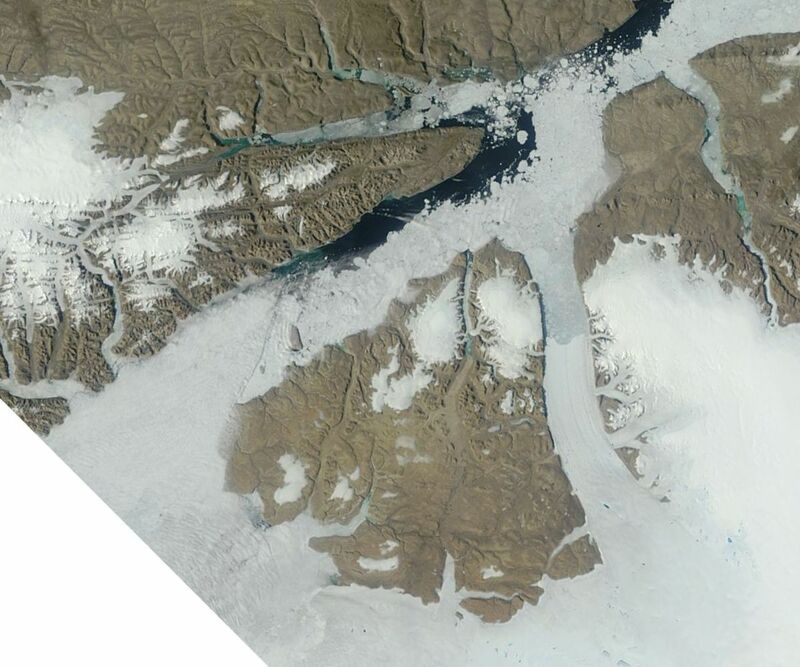 Greenland side of Kennedy Channel largely free of ice as the wind causes "upwelling" there (and downwelling off Ellesmere). Ocean dynamics beautifully visualized by the ice as a tracer for surface ocean flow. Andreas - when you do, please post a link to your blog, I'll be very interested in reading it. http://icyseas.org/ you can also find the link quickly in Andreas Muenchows profile or on Neven's blog page. Departing Kangerlussuaq on August 18; traveling the route clockwise; returning to Kangerlussuaq September 6. The vessel is ice-reinforced, but not an ice-breaker. Just to be clear, I'm concerned about the coastal regions that are still showing 50-100% ice concentration on the Uni Bremen site. Would anyone please like to take a guess regarding whether it is going to be feasible to travel this route and hopefully get ashore in various places, especially on Baffin and Ellesmere Islands and on Greenland well north of Qaanaaq? 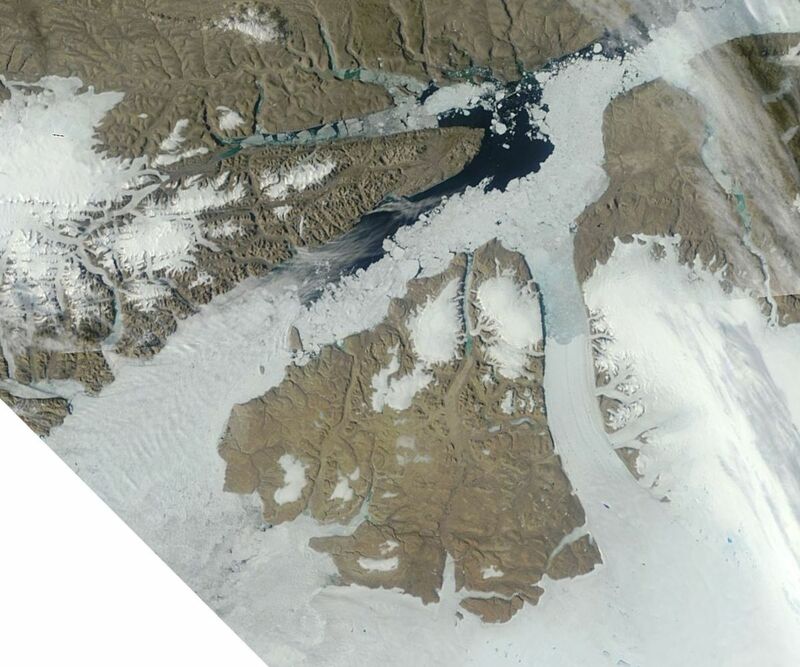 Personally I don't see the ice in Baffin Bay lasting that much longer, but then I've never been further north than Oslo! I'm also guessing (hoping!) that there will be enough melt along the coast of Baffin Island to get ashore there in some locations. But I'm particularly concerned about the heavy ice hanging on in Kane Basin and in all the bays along the southeast coast of Ellesmere. Hopefully news from Oden will clarify the situation. You should be fine if you stay on the Greenland side up to Qaanaaq and Smith Sound. It should also be possible to cross over the the Canadian side from there, perhaps visit Grise Fjord, then head south again. I very strongly recommend against going any farther north. The moment you cross Smith Sound and Cape Sabine, there is no way to assure you or your ship will get back out. Many larger ships got crushed, stranded, or blocked at the endtrance to Kane Basin for the last 150 years. Even if it looks good for a day or two because the winds are favorable, the very strong tides, the fickly winds, and the ice shifting fast, this is not something to take lightly, it is not a place to go without lots of resources. The Arctic is not a place to count on luck. be careful, enjoy your freedom of movement, enjoy your boat gives you. Just don't sink it all by trying to do too much without proper preparation that may take years. While this is a very good site, it is not a good product to navigate by. The resolution is too coarse and not always accurately represing actual ice conditions. 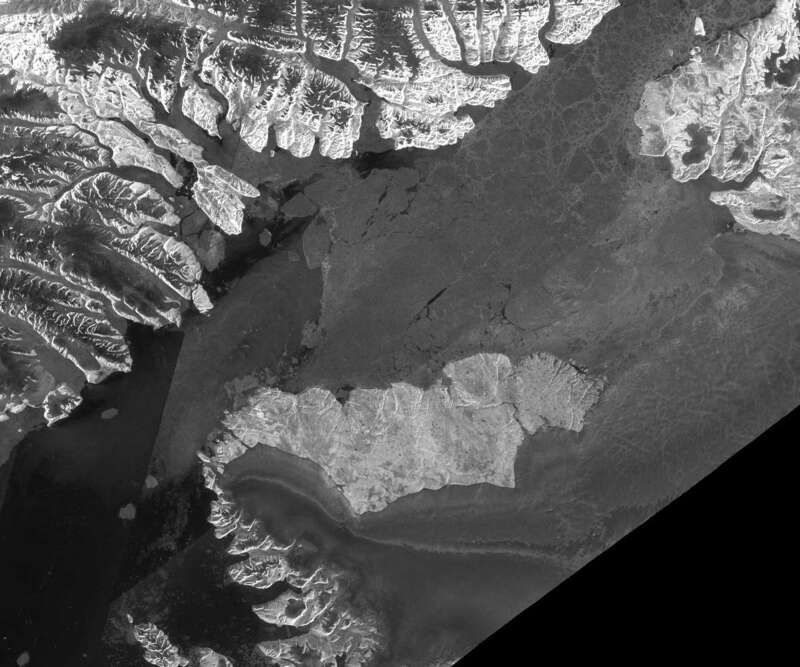 You should be looking at LandSat (free) or RadarSat (very expensive) at 30 m resolution to get a feel for what the ice may look like from the ground. There are many resources here on these forums (Sentinel), but Uni Bremen ice maps are NOT a tool to plan an actual sail with, because the pixels are too big. Thanks very much, Andreas -- greatly appreciated! I'm not responsible for doing the actual planning or navigating; thankfully, there are people far more knowledgeable than I am who are in charge. (I'll be doing photography.) I'm trying to anticipate where we'll likely be able to go and which locations won't be reachable. Do you think it might be feasible to get farther north than Grise Fjord by late August? EDIT: "farther north than Grise Fjord" along the coast of Ellesmere. This is a particularly problematic year. 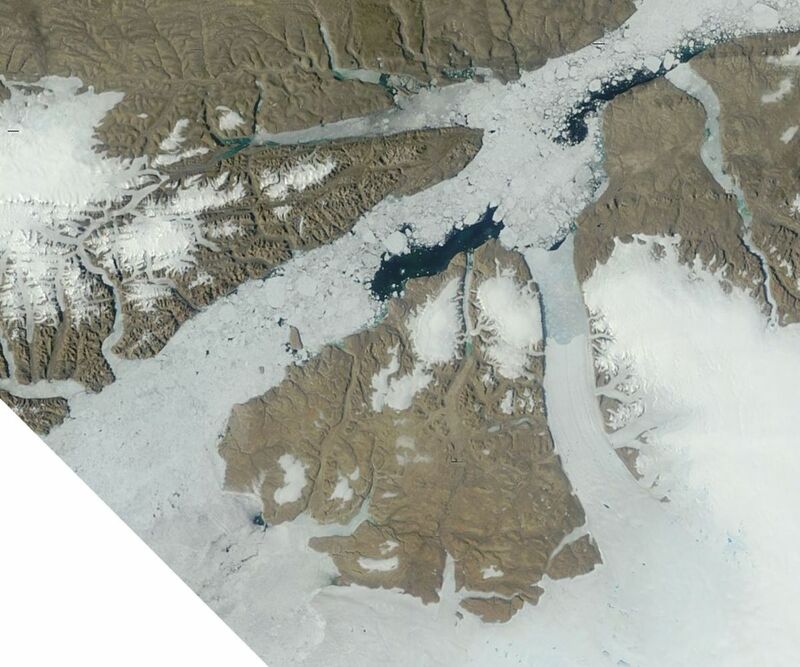 The ice has backed in again to Petermann fjord, refilling it. Melt lakes on the ice shelf peaked about 3 weeks ago, little is left for steam drilling; and the 35 km of kayakable central drainage never filled. A leg of the Amundsen just got cancelled, GeoTraces sciences. As I read it, 2-3 commercial supply ships wanted an icebreaker to fulfill fuel contracts with small coastal communities, a non-emergency situation but one that was costing them money to stand off waiting for the ice to clear. They got the government to issue the necessary orders. Nothing else was available as icebreaker because of budget cuts. Instead of carrying 40 scientists deep into the Arctic to research climate change, the Amundsen has been temporarily reassigned to break ice for several commercial supply ships. The Amundsen on Sunday pulled in its scientific probes, did a U-turn in Davis Strait – between Greenland and Nunavut – and headed to the south tip of Baffin Island. 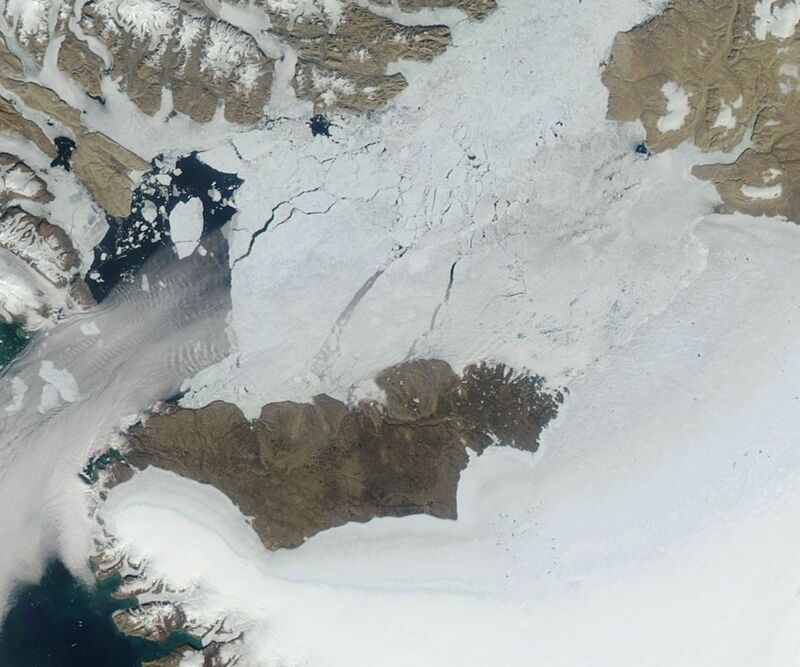 “The Amundsen has never been diverted from science for ice breaking duty in the Arctic according to the Captain,” wrote Dr. Cullen, a University of Victoria researcher whose Geotraces project relates to the impacts of ocean acidification and climate change effects. He said research projects, some of which took four years to plan, will have to be cancelled. Dr. Cullen said he understood the urgency of helping supply ships, but was disappointed the Coast Guard didn’t have any other vessels available. He said two other Coast Guard vessels in the region weren’t available. The Pierre Radisson is busy helping a fuel tanker trapped in ice in Frobisher Bay and the Terry Fox had to be sent back to port in Newfoundland to resupply after escorting ships through the ice. Thanks a lot, A-Team -- very helpful! I heard about the Amundsen a couple days ago. Terrible situation for the scientists. Jenny, if after your journey you want to use the Arctic Sea Ice blog to share images or texts, send me a mail. the Oden should be getting near the ice by now. According to http://oden.geo.su.se/map/ their speed has dropped to near 0. They must be in the ice now. speed has dropped to near 0. They must be in the ice now. Been doing some probing it look like, then backing out and trying somewhere else. Or they may be doing planned science experiments. Red lines are the nominal course in and out. It clears up quite a bit the way they are headed and Petermann is fully accessible. 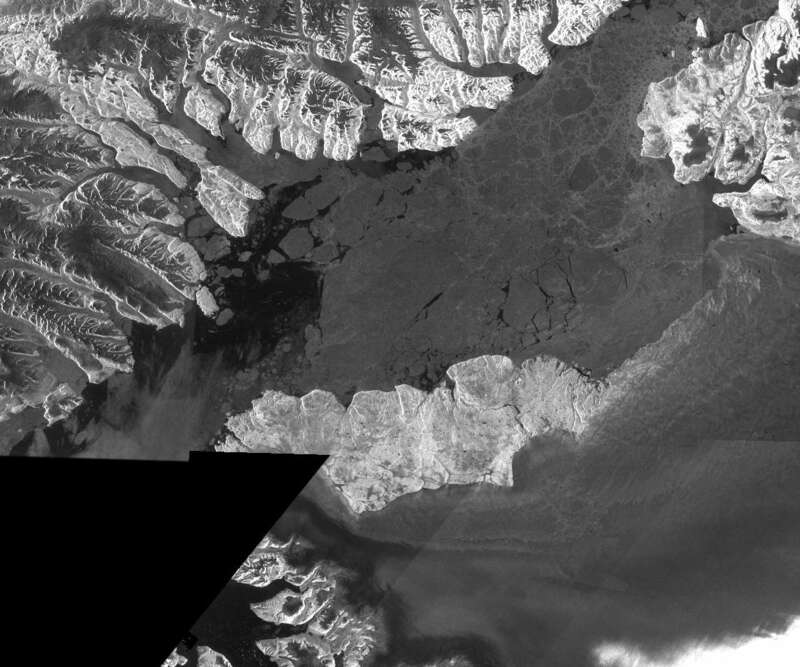 How does one differentiate between cloud-cover and ice on Sentinel images (other than by experience)? Basically, Sentinel sees through clouds. There are some effects, sometimes, mostly away from the center, and you can get what appear to be shadows or brightening. I think all the 'white' on the lower left of the above image is bits of ice. Attached is an enlargement of some of that area. I wonder if the white 'worm' path on the right side (centered top-to-bottom) is the ship passage. Thanks, Tor. Why is some of the ice whitish/light grey, while some is dark grey/nearly black? Different ice densities or surface characteristics? "I wonder if the white 'worm' path on the right side (centered top-to-bottom) is the ship passage." Interesting. Seems to be roughly in the right place. I am a learner in that respect myself but what I know so far is that these radar images are basically showing gradients in terrain, you see one side of a mountain as a bright area, the other as a dark area. Which side is bright and which dark depends on orientation of the satellite, the attached images were taken in different orientation. It looks like the mountains are illuminated from the side but of course the "illumination" is produced by the satellite radar. It doesn't just show largescale sloping gradients it also shows roughness. It picks out crevassing on glaciers and cities in light shades because there are different echoes from the top and bottom of buildings for example close together. On smaller scales broken up bits of ice also shows up brighter than flat expanses of ice. But old multiyear ice also has a bumpier surface than smoother one year ice. Then there is the question of what surface does the radar "see". The frequencies which it uses are AFAIK reflected differently by snow and ice and water. I think this is what gives those bands on the ice cap seen in the bottom left of the images. Thick snow and firn seems to always appear bright. An important difference between the 3107 and 0108 images is that the water surface (identifiable from the visible terra image) is also bright in some places in the 3107 image. Rough water surface, waves also give a "bright" response, depending on the orientation of the satellite. Despite the different times these images were taken there are recogniseable ice floes in all three. How different they can appear shows how much background information is needed to interpret these reliably. Sometimes it is easy to make an educated guess, sometimes not so much. Best I can do at the moment is look carefully at many images and detect patterns. Thanks, Andreas T. Very interesting and helpful. I've always wondered about the thickness of the ice in the Lincoln Sea given the various modeled sources of thickness maps. Now the Oden is in the Nares and is seeing chunks of ice flowing in from the north. They posted a photo. 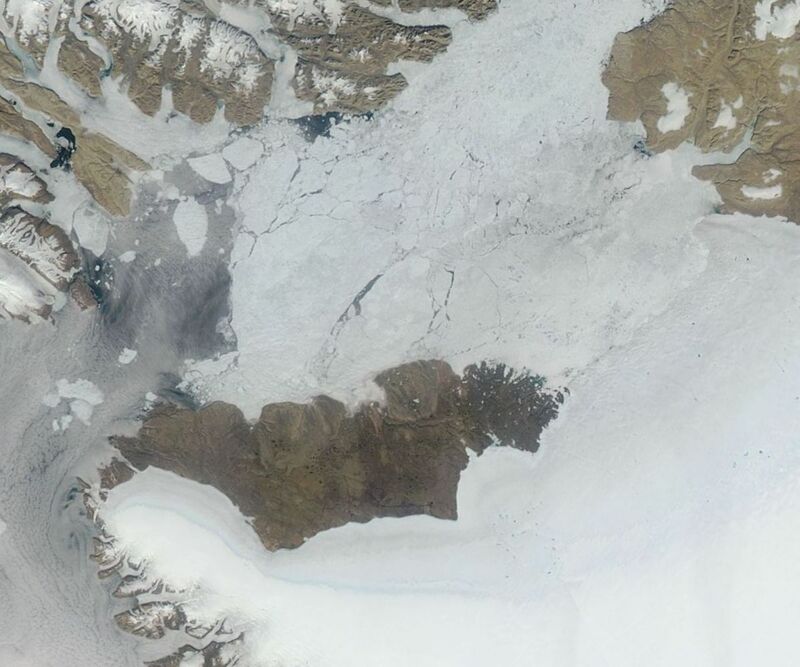 The estimate from the tweeter is that the pieces of ice they are seeing are 4-5m thick flowing in from the north.